It wasn’t exactly the “24 Hours of Thornblade” but for some of the boys it seemed that way. After trying until almost 9 pm on Tuesday (First Round)The Blade Junior could not finish the first round because of heavy rain and lightning. Golfers had to come back at 8 am on Wednesday to finish the first round and then play the final 18 holes of the championship. Heavy rain and lightening forced the first round to be postponed for dozens of golfers at The Blade. 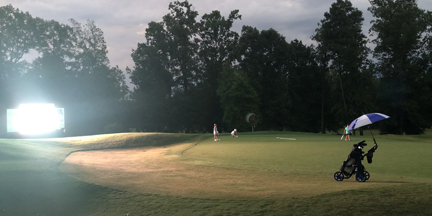 The scoreboard light helped the younger player division finish on Tuesday night. “Thornblade superintendent Randy Long and his crew did an amazing job to get the golf course in shape,” said tournament director Rob Reeves. “They had to do it twice. We had rain on Monday and again on Tuesday. 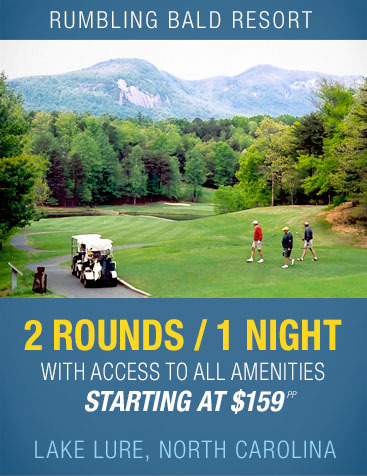 He had the course in great shape for the golfers,” he said. The girls division made out better than the boys. The 13-18 year old girls had finished their first round so they were able to play the final round on schedule. Anna Morgan led the first round by a shot and finished with a two shot victory at The Blade. 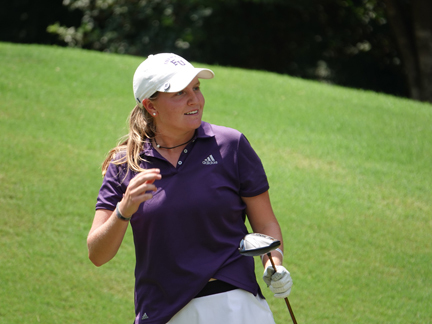 Anna Morgan from Spartanburg held the lead after the first round. The girls play the Thornblade course at par 72 and Morgan carded a 70. 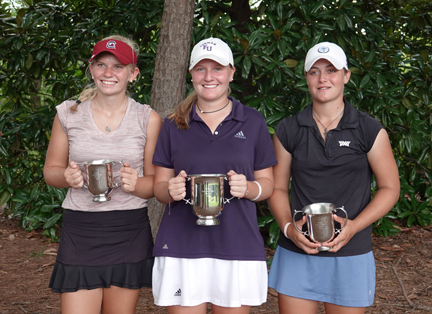 The future Furman golfer led future Gamecock golfer Smith Knaffle of Murrells Inlet by a shot with Elle Johnson from Inman and Abigail Schimpf of Daniel Island each two shots back in a tie for third. In the final round Morgan bogeyed the third hole and dropped into a tie with Knaffle until a birdie on the par-5 fifth hole gave her a one shot lead that she never gave up. “I’ve been working on just focusing on my game and doing what I need to do,” said Morgan. “I really didn’t want to know what everyone else was doing,” she said. While Morgan was able to hold off Knaffle, Schimpf closed the gap on the Spartanburg golfer to one shot by the 16th hole. However, a bogey on the par 3-17th hole allowed Morgan to play the final hole with a two shot lead. Anna Morgan (c) won The Blade girls championship. Abigail Schimpf (r) finished second with Smith Knaffle (l) finishing third. After an errant tee shot on number 18, Morgan was glad she had the two shot cushion. “I think I hit my driver a few too many times. I should have played smarter, but it worked out and I was able to grind through to a win,” she said. Morgan recovered from the rough and trees to card a par on the final hole. Schimpf also pared the final hole to finish second, two shots behind Morgan. Knaffle bogeyed the hole to finish in third. Johnson and Savannah Hylton from Hilton Head tied for fourth place with MK Talledo from Boiling Springs and Anna Grace Brock from Greenwood tied for sixth place. “I’ve had some top finishes, but I’ve missed out on some wins. I’m glad I was able to come out a prove I can put two solid rounds together and to get a win in this tournament feels great,” said Morgan. Bronson Myers had the lead after the rain delayed first round was completed. He shot a 4-under par 68 in the second round to win The Blade boys title by four shots. In the boys division some of the golfers had to play as many as eight holes before starting the final round. When the first round was completed Bronson Myers of Columbia had the lead. Myers shot 70 in the first round to take a one shot lead over four golfers. Greenville’s Rafe Reynolds, Dillon Hite of Lexington, Zach Adams of Charleston and Thornblade Club member Tillman Alverson. The future Elon golfer added to his lead with a birdie on the par-5 fifth hole, but gave the shot back with a bogey on the eighth hole. Only Chesnee golfer Garrett Cooper was able to stay within a shot of Myers until the 14th hole. On number 14 Myers made a birdie and added a second birdie on number 15 while Cooper bogeyed the 14th and 15th hole to fall behind by five shots. “My putting really was good,” he said. “I made everything inside of 10 feet today. Yesterday I never got it to click,” said Myers. Myers finished the second round with a bogey on the final hole, but with a comfortable lead it didn’t matter. The champion shot a final round 3-under par 68 to finish at 4-under par for a four shot victory over three golfers. “I won the Cheraw Fall Challenge so it feels good to get a win in a big tournament like this, it has been awhile,” said Myers. Chesnee’s Garrett Cooper tied for second place in the boys championship at Thornblade. Cooper, Hite and Keegan Vaugh of Myrtle Beach all tied for second place. 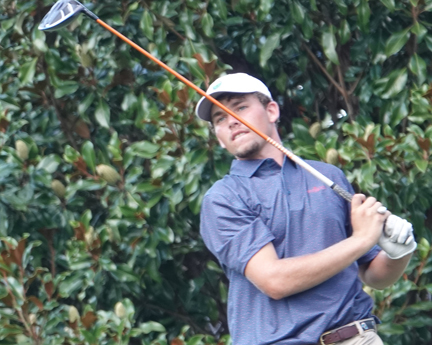 Gene Zeigler of Columbia shot the best round of the tournament carding a 5-under par 66 in the final round to move into a fifth place tie with SCJGA Junior champion Daniel Azallion of Hilton Head and Thornblade Club member Alverson. “There have been a lot of great players who have won this tournament and I’m glad to have my name with those players,” concluded Myers. The Boys 10-12 year old division was won by Clayton Taylor of Inman edged out William Jennings by a shot for the title. The girls 10-13 year old division was won by Madison Messier. The Blade chairman Rob Reeves presents the Spirit of Courage award to former Clemson golfer Austin Langdale. 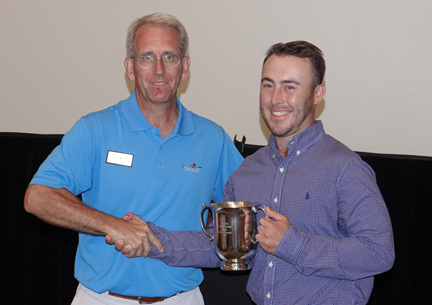 As part of the tournament a special award was presented to former Clemson golfer Austin Langdale. 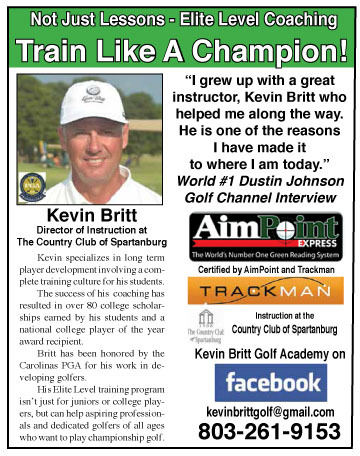 The Spirit of Courage Award is given to a golfer who has displayed off the course character in a difficult situation. Langdale was diagnosed with Multiple Sclerosis after his graduation affecting his desire to play professional golf. 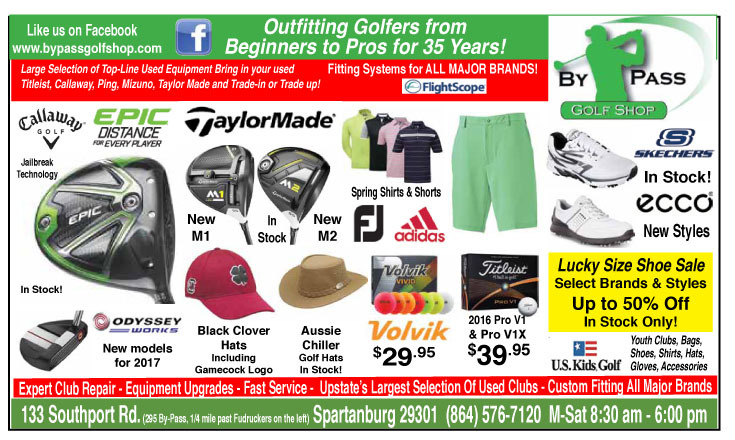 Langdale has stayed active in the game by regaining his amateur standing and working as a club fitter and demonstrator for Taylor Made golf. 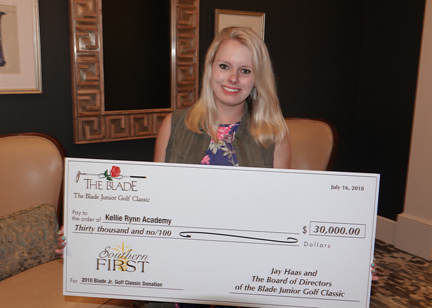 Kellie Rynn Academy founder Kathryn Martin received a check for $30,000 from The Blade Junior. Each year The Blade selects a charity to receive e the proceeds from the Junior Am tournament. This year the Kellie Rynn Academy in Greenville was presented with a check for $30,000. The funds are used for deserving families to provide the highest quality education and childcare services by awarding scholarships to children of diverse ethnic, socioeconomic and family backgrounds and aid in providing a safe, nurturing home through family health and safety training.